The Valley of the Sun Clean Cities Coalition is one of 90 coalitions across the country designated by the U.S. Department of Energy to reduce the use of petroleum motor fuel. These efforts are directed under the Clean Air Act and Energy Policy Act to reduce air pollution and dependence on foreign oil. Every two years, Valley of the Sun and Tucson Regional Coalitions stage a Legislative Breakfast, where legislators, staff and civic leaders are invited to learn the latest in the means of reducing the use of petroleum fuel. This event features key speakers and a comprehensive display of alternative fuel vehicles. A key element of this event is the recognition of those individuals who have made extraordinary contributions to these goals. Different categories are selected every two years to focus on the field of award winners. Categories in prior events have included: major fleet managers, Arizona mayors and military base commanders. This year, the categories selected were state legislators, their staff and Arizona universities. 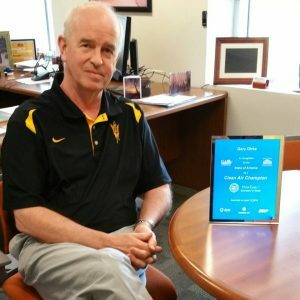 Arizona State University’s Gary Dirks, director of the Julie Ann Wrigley Global Institute of Sustainability and ASU LightWorks®, stood out as an individual who has made the greatest contribution to our goals of clean air and energy security. His work with the ASU Wrigley Institute and ASU LightWorks® clearly fits the spirit and results in alternative power. Solar- and wind-power projects, assisted by these departments under the direction of Dirks, are taking a meaningful and increasing share of fossil fuel power generation. The ASU Wrigley Institute is making a similar contribution in urban planning and traffic direction to reduce commuting and commercial trucking. These disciplines perfectly blend into the trip reduction, mass transit development and areas such as GPS-directed fleet travel. Valley of the Sun and Tucson Regional Clean Cities – with additional sponsorship from APS, SRP and Southwest Gas – are proud to recognize Dirks and those who have made such meaningful contributions to clean air and energy security.